1. Stay Alert… by isometrically contracting each muscle group in your body for 10 seconds. 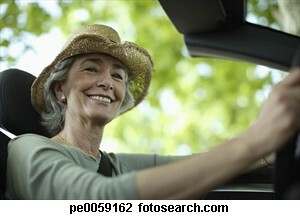 You get a mini-workout while keeping yourself alert and awake behind the wheel. Make a tight fist. Extend your fingers straight. Curl your toes tightly. Pull your toes back towards your shin. Push your thighs down into the seat. Push your back into the seat. Shrug your shoulders. Pull your shoulders down away from your ears. Rotate one arm at a time – first twist your arm in then twist it out. Lift your thigh up against the resistance of one hand then repeat with the other leg. Hold your abdominals sucked in as hard as you can. Hold a kegel. 2. Don’t Wreck Your Waistline With Snack Foods…munching does help to keep you alert and awake on a long drive so make your munchables raw produce only. Try snow peas, sugar snap peas, carrots, cucumbers, celery, and apples. All of these foods are low glycemic index and super high in fiber. Also, keep your beverages to ones that do not taste sweet or else you will risk creating cravings for sugary or starchy “waistline wrecking” foods. Try coconut water, seltzer water, iced coffee (not coffee flavored milkshakes!!! ), or stick an herbal tea bag into your water bottle. 3. 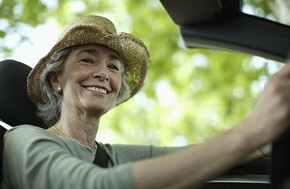 Take breaks…get out of the car – walk or simply do 10 jumping jacks. You will get movement into your spinal joints that aren’t too fond of being sat on for long periods of time.